The kids love to cook. Marcel makes a mean lasagne or chocolate cake. Lots is great at pancakes. Pudge likes to cook everything, scrambled egg in particular. They quite often get in a bit of a mess cooking. I always thought professional chefs' jackets cost an arm and a leg so had never even considered one before meeting Thomas. Thomas had one, of course, but then he knows how to cook properly, so again I assumed they were dear. 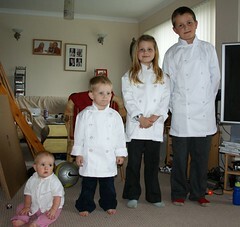 He had always moaned about his being too big so I went onto Nisbets kitchen website to check out new ones only to find that professional chefs' jackets, in both adult and kiddie sizes are dirt cheap. So now school clothes can be protected against chocolate, sparking grease and pasta sauce and they can look cute as hell. Only problem is that with the jacket on, Marcel will probably assume it is ok to swear like Gordon Ramsay, even in front of Pudge, just for effect.